Shortly after Darius Clark Monroe’s 16th birthday, he and two of his friends robbed a bank at gunpoint. Darius had been an honors student in Houston, Texas, and this was his first run-in with the law. He served the next three years in prison. But 20 years later, that day stayed with him. So Darius began finding some of the customers who were at the bank during the robbery. One of them was David Ned, a pastor and father of four. Next, we’ll hear about another complicated reunion between Bryan Wilmoth and his brother Mike. A family of eight siblings, they were raised in a strict, religious household in central California. Bryan was the eldest, the classic big brother. But when Bryan was 19, their dad kicked him out after finding a love letter he’d received from another man. It wasn’t until all of Bryan’s siblings left their family home, that he reconnected with his brother. In this episode of the StoryCorps podcast, these four men reflect on relationships that started out rocky, and the eventual reunions that led to second chances. 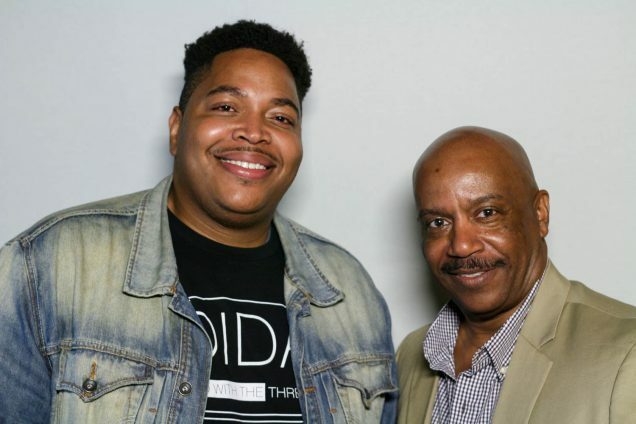 Second photo: Darius Clark Monroe and David Ned at their StoryCorps interview in New York, New York. Photo by John White. 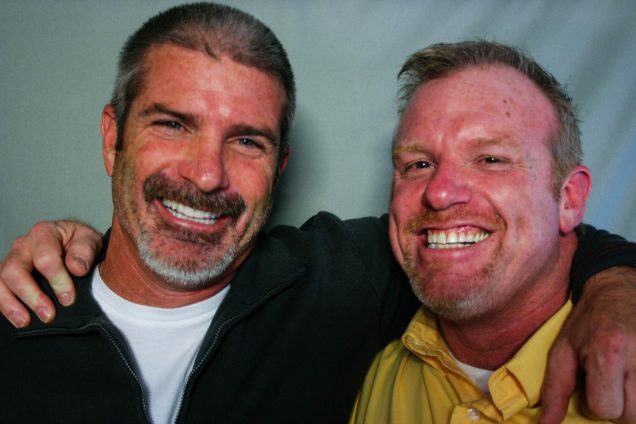 Bottom photo: Mike Wilmoth and his brother Bryan Wilmoth at their StoryCorps interview in Los Angeles, California. Photo by Chaela Herridge-Meyer. Jasmyn Morris (JM): On this season of the StoryCorps podcast, we’ve been sharing stories of reunions, and what it means to come together, even after something unthinkable happens. David Ned (DN): When you came into the bank, you made us all lay on the floor. Can you imagine laying on the floor and all you hear is that shotgun, clack clack? JM: In our last episode of this season, how two very different reunions lead to friendship, family, and second chances…. Bryan Wilmoth (BW): I remember hearing that if you guys talked to me, if I’d call the house, that you’d get a beating because Dad didn’t want you to ”catch gay.” And you guys believed that. JM: It’s the StoryCorps podcast from NPR. I’m Jasmyn Morris. Stay with us. JM: When people think about StoryCorps, they often think of two friends or family members coming to one of our recording booths for the conversation of a lifetime. It’s 40 uninterrupted minutes with someone you love…. But that’s not always the case, sometimes people come to StoryCorps to have otherwise impossible conversations. In 1997, Darius Clark Monroe was a high school honor student in Houston, Texas. He had never been in serious trouble before. But that changed shortly after Darius’ 16th birthday, when he and two of his friends robbed a bank at gunpoint. Darius was arrested in February of that year and served the next three years in prison. After he was released on parole in 2001, he went to college at the University of Houston and then to film school in New York. But even twenty years later, that day in the bank stayed with him. So Darius began tracking down some of the customers who were there at the time of the robbery. David Ned (DN): How did you get to that point where you said, ”I’m gonna rob a bank”? Darius Clark Monroe (DCM): What was happening at my house was that things weren’t going well in terms of the finances. My parents were working all the time. And once they told me that we were in like $25-30,000 of debt I was thinking, How am I going to help because nobody else is going to come save the day. And so one day on TV, there was this guy who had robbed this bank. And I was struck by how easy it seemed. DN: Did you really think you was gonna get away with this? DCM: I literally thought no one would ever find out. It took almost four weeks before I was arrested and then sent to prison. DN: How many years they was giving you? DCM: Mm-hmm. When I got out, I wanted to apologize to the people who were inside the bank. And when I spoke to you it was the first time I got to truly understand the seriousness of what I did. DN: So that was hard for me because I had to come to grips with that. And one thing that helped me when you came by and asked me to forgive you, years later, I thought about my son. He could have been put in jail, because he’s been through some stuff. But should he ever turn his life around, I would like that somebody he may have taken advantage of would give him a second chance. DCM: It has been incredible to be given a second, third, fourth shot and, having you be a part, has given me hope. DN: I’m really proud of you. And uh, I don’t know if you’ve got a good relationship with your dad. But, if you don’t, he’s the one that missed out on a great son. And I’m here to do whatever it is I need to do, 17 years later, to help you be a great young man. JM: That’s David Ned and Darius Clark Monroe… at StoryCorps. They still talk regularly, and have grown even closer since they recorded their StoryCorps interview in 2014. Darius went on to reunite with a few others who were in the bank that day… and even made a documentary about it. It’s called Evolution of a Criminal. JM: Hey listeners… Since this is the final episode of our season on reunions, we wanted to take the opportunity to connect with all of you and hear your thoughts on the StoryCorps podcast. Please take a short, anonymous survey at “n-p-r dot org slash StoryCorps survey (all one word),” and let us know what you liked, what you didn’t like and what you want to hear more of on future seasons. The survey only takes a few minutes, and your opinion matters. Thanks! We look forward to hearing from you! Bryan Wilmoth (BW): Dad found a love letter from a guy in my box of things, and he read this letter and lost it. He took me for a ride and dropped me off in the middle of the night with a $5 bill. That’s sort of all I remember—sleeping outside in the country that night. And I really missed my brothers and sisters when I left home. I remember hearing that if you guys talked to me, if I’d call the house, that you’d get a beating because Dad didn’t want you to ”catch gay.” And you guys believed that. Michael Wilmoth (MW): Granted, it was a fear-based belief. BW: Or ran away, in your case. I would make an effort to try to contact you guys and be a big brother again. At first you were really resistant. You didn’t know anything about gay people. BW: Didn’t want to. And it took a long time for our relationship to build. But, after you started to accept it, every time you met another gay person, you would say, [Laughs] ”Oh, you’ve got to meet my brother,” and hook me up with every guy that you thought was gay. BW: I always thought that was really sweet. And that’s when we started coming back together, you know, as brothers and sisters. Bryan, Pam, Chris, Mike, Jude, Amy, Josh, and Luke-Henry. Now, Luke-Henry I didn’t even know because he wasn’t born ‘til I was like 19 or 20. And I hadn’t seen him since… ever. And I got a call and the voice on the other end said, “Bryan? This is your little brother, Luke.” By this time, you know, he was estranged from mom and dad too, and he wanted to go to the University of Dallas. So I took my savings, which wasn’t a lot, and I bought one, one-way ticket and one round-trip ticket to Dallas. Mind you, this is a Catholic school, and I’m the big, gay brother. I’m running around getting him set up for his dorm room. And we go through this whole weekend, and at the end, I gave Luke a hug and a kiss and told him how much I loved him, and he started walking away. And I was just watching after him, like, Wow, I really finally got to be a big brother. And at that moment, he turned around and mouthed, “I love you.” It was the most beautiful moment I had ever experienced. And I called you from the hotel, sobbing. Do you remember this? MW: Yeah. You brought eight siblings that were so far apart to be as close as we all became. BW: I just want you to know how much it means to me that you have loved me like this. And for that I will be forever grateful. It is what I built the foundation of the rest of my life on. MW: And let me say that forty minutes isn’t enough. I could do this for four hours, four days, four months. You’re a good man. BW: Well, thank you, Mike. JM: That’s Bryan Wilmoth and and his younger brother Michael Wilmoth. Since their StoryCorps conversation first aired in 2013, thousands of listeners have reached out to Bryan offering their support and gratitude. He’s heard from parents and children alike… other young people who’ve come out and lost family along the way. As a social worker, Bryan says he tries to connect people to resources whenever he can. He’s still close with his siblings and welcomes a reunion with his father if the possibility ever presents itself. That’s it for this episode… and for this season of the StoryCorps podcast. We will return to your podcast feed in the Spring with a new season and a new theme. We’ll be sharing stories around the 50th anniversary of the Stonewall riots – a pivotal moment in the fight for LGBT rights. So if you or someone you know was connected to the Stonewall riots, or just has stories from that era… we want to hear from you! You can give us a call and leave us a voicemail at 301 744 TALK. Until next season, you can find StoryCorps on NPR’s Morning Edition every Friday. This episode was produced by Jud Esty-Kendall and me. Our engineer is David Herman, script editors are Danielle Roth and Sylvie Lubow. Special thanks to Michael Garofalo, Chaela Herridge-Meyer and Sophia Simon-Ortiz. For the StoryCorps podcast, I’m Jasmyn Morris. Until next season, thanks for listening.